We are reaching out to companies that make a difference in green home remodeling and construction. Years ago we created Sustainable Environmental Education (SEE), a 501 ( c ) 3 organization and our media outlet, Things Green. Back then we knew nobody knew what nobody understood the word sustainability, environmental nor green. But, in our vision we forecasted that one day those words will be better understood, embraced as a lifestyle along with being affordable. Just a few short years ago many components that go into a net-zero energy efficient home were too expensive. Now, the tide has turned and it's time to strike by creating a TV series for the most powerful viewing audience, the PBS family of viewers. The project is called Things Green-House. In addition to the TV show that will air on PBS|KLCS TV a guarantee of two times then in random order in perpetual reruns we will be including you in our blog, social media (twitter, facebook and LinkedIn) and on our Amazon Prime channel, Things Green. We are filming aspects of the project in Spanish,too! The show is called Temas Verdes (Things Green) hosted by sustainability expert Patty Menjivar. If you have someone on your staff that speaks Spanish, great! If not, no worries as we'll do our magic to make sure the audience understands. That's two different TV shows you'll be on! The concept of what we are doing is pretty simple. We are building a 638 square foot second home with an 800 square foot bonus room and upgrading an existing 2500 square foot attached home in Whittier, CA. 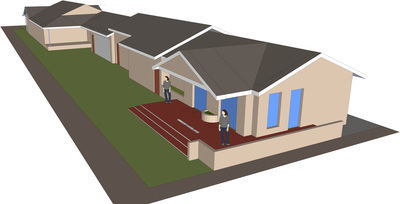 This way viewers will be able to retrofit their existing home and/or build a secondary home. The amount of television time you receive is based on product and installation value. In the simplest of terms if you are donating flashing, we'll show your flashing on TV. If you are installing the flashing with your installers (or pay to have our installers do it) you get more TV time. Should you want to be interviewed there is a fiduciary obligation that must be met based on the value of the product and the installation. Finally, if you are a local company (southern California) we can work it out to come to your facility to show the manufacturing process as well. Before we can go any further we need to know what it is you bring to the table. How involved do you want to get? What is the value of your product for the overall project? Are you going to install the product or do you need our contractor to do it? Once we have these questions, plus a few more, answered we'll be able to give you options to choose from. IF YOU WOULD LIKE TO GET INVOLVED WITH THIS PROJECT, PLEASE BE DETAILED IN THE COMMENT SECTION BELOW. The amount of energy provided by on-site renewable energy sources is equal to the amount of energy used by the building. The renewable energy we will be taping into is collected from resources in important areas of: electricity generation, air and water heating/cooling, architectural design technologies. H-Forms is a complete warranted system for building structural buildings and landscape walls. The system uses insulated concrete form technology to eliminate the use concrete masonry unit (CMU) concrete blocks, and includes all the necessary forms, foundation materials, reinforcing mesh, stucco and accessories needed to complete a project.